This Green Triangle tour is organized by Make My Trip India which will take you to the beautiful hills of northeast India. All the places covered by the tour have special importance and beauty. Kalimpong is a small town covered by tea gardens, snow capped mountains and wonderful water falls.In Gangtok you can see many monasteries and snow capped mountains of Kanchendzonga. In Darjeeling you can see vast tea gardens, mountains and deep valleys. Given below are the details of Itinerary of the tour package. On arrival at NJP railway station or Bagdogra airport the representative will take you to Gangtok. Check into the hotel and stay overnight. After having breakfast trip for an excursion tour to Tshangu Lake which is 3 hours journey from Gangtok. The lake is situated at an altitude of 12400 feet and its average depth is 50 feet. Come back to the hotel and stay overnight. After breakfast trip for a half day sightseeing tour to Jhakri water falls which is 4 hours journey from Gangtok. After that visit Droul Chorthen, Research Institute of Tibetology,and Directorate of handicraft and handloom. You can enjoy the flower show which is very popular. 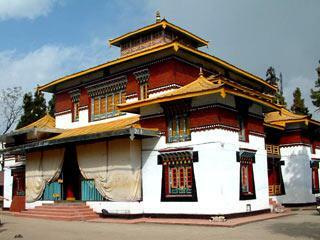 Afternoon,move to Kalimpong and on arrival, at Kalimpong check into the hotel and stay overnight. After breakfast visit Dr Graham's Home, Dello hills, Flower Nurseries, Jang Dong patriffo Brang and Durbin Dara hills. Afternoon, move to Darjeeling and on arrival, check into the hotel. Stay overnight. Early morning visit Tiger hills situated at the height of 8364 feet. From Tiger hill you can view the wonderful sunrise over Kanchendzonga peak. After that, visit Groom Monastery and Batasia Loop. After breakfast trip for a half day sightseeing tour to Japanese Temple, Peace pagoda, Pasmaja Naidu Himalayan Zoological Park and Himalayan Mountaineering Institute, Tenzing & Gombu Rock, Tibetan Refugee Self Help Centre and Tea Estate. Come back and stay overnight in the hotel. After breakfast move to Mirik which is at the height of 5800 feet. On arrival, check into the hotel and trip for a half day excursion to Pashupati Nagar and boating on Mirik Lake. Return back to the hotel and stay overnight. After breakfast, move to NJP railway station or Bagdogra airport for your onward journey.